1. Conforming to fact and therefore worthy of trust, reliance, or belief: an authentic account by an eyewitness. 2. Having a claimed and verifiable origin or authorship; not counterfeit or copied: an authentic medieval sword. There are nearly 6 million Americans living with some form or degree of paralysis requiring the use of a wheelchair for their mobility? There are more than 56 million Americans with adisAbility that is significant enough to alter at least one daily activity? And the U.N. estimates there are more than 650 million globally with a significant disAbility! 1. Abilities United Productions' have an authentic voice, authentic vision, and authentic performances - using writers, directors, and actors with the same or similar disAbility as the featured character. Why is this an issue? How is it significant? For those who live with a disAbility, their disAbility is as significant of a factor in their identity as is their age, gender, or race. Having a person who does not live a life with such a significant disAbility is an insult by placing such a indignificanceon it that anybody can represent. When asked, NO able bodied person will say they know what it is like to physically, mentally, emotionally, economically, or socially understand what it is like to live with a disAbility - so how and why are they the only ones representing those with a disAbility? 2. Abilities United Productions' are not stereotypical characters or stories. This is part of the Content-Specific element in all of our film projects. There are 3 stereotypical categories that nearly all previous and current movies, outside of Abilities United, use with characters and stories that feature a character with a disAbility and again more specifically, paraplegics using a wheelchair. a) it is all about the disability - how difficult it is when first becoming disabled and/or how to live with it. And a lot of them regardless of which category or combination they stereotypically fall into - are based on a real person - this is Hollywood's superficial attempt at convincing themselves and others that the film is authentic. These are the images, stereotypes, industry practices, and attitudes that anybody can represent those with a disAbility except those with a disAbility - that Hollywood insists on perpetuating. And since society is influenced by our culture and our culture is heavily influenced by entertainment - the general population's opinions when they see a paraplegic or someone with a disAbility is that since there are very few movies featuring those with a disAbility - they are obviously not important people in our society, AND if that paraplegic or person with a disAbilty does not fit into one of the stereotypical categories = then those person's have no worth in society. This is the results from limited and only stereotypical images in movies and television. That will change with Abilities United efforts and films, but not alone and not over night. Still the first step, film and all future ones are exciting and important toward fair and equal opportunities in representing honestly and authentically! 3. Abilities United is commited to entertainment and is shown in our Universal Appealing element in all of our film projects. 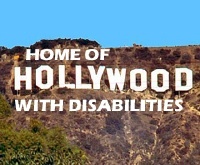 All of our movies are Universally Appealing - meaning that although they do portray and represent the target market segment of those with a disAbility who will become a loyal audience, they will also crossover and have mainstream appeal - attracting general audiences based on ratings and genre in BOTH domestic and international markets! The following are the authentic film projects that Abilities United Productions is currently developing and preparing for production at this time. Please click on them to learn more and immediately notice how subtle and yet significant these characters and stories are compared with all previous movies that featured paraplegic characters. And do keep in mind - as part of our marketing strategy will do before the release of any film - that these are written, directed, and performed by paraplegics. This provides a uniquely genuine and authentic feel to the audience watching these movies. This drawing picture is used by permission and © by Mark Lengeneckert.